Sony has shown its strength in the competition with Canon, Nikon and other players in digital camera market. Despite of the price, the lens of Sony camera is second to none, which makes Sony digital camera a wonderful choice for both experts and beginners as the best YouTube camera or other purpose. However, hundreds of Sony camera users lose their delicately taken photos and videos every day. It is a great pity for every photographer to lose precious works along with the memories that will never return. 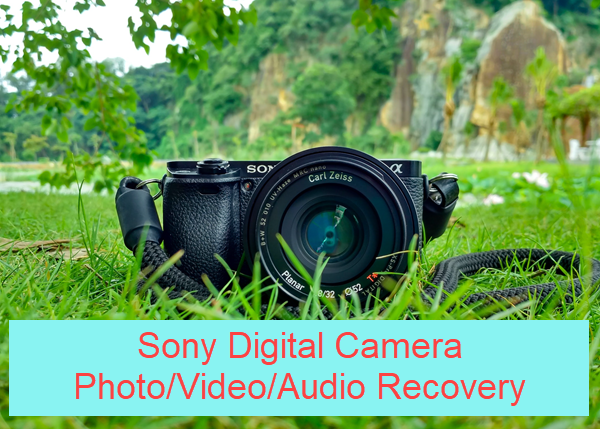 Luckily, we have figured out a solution for recovering deleted or formatted Sony camera photos for free, and now present it to you in this tutorial. No matter which digital cameras you buy from Sony, they are need storage media to support the secure and high-speed capturing and recording for HD pictures and 4K videos. Currently, Sony DSLR, Compact Camera and video cameras are equipped with the following storage devices. The security and speed surely vary from Class 2 to Class10 accordingly. Now that we have known the storage media of Sony digital camera, then how is it possible to undelete lost photos from Sony camera? These memory cards often come with FAT32 file system (exFAT will be available on SD 4.0). As a general rule, when a file is deleted from the storage device, the file system just marks the original space as available for occupying by new data, which leaves us a chance to rescue lost files before they are being overwritten. Find a free Sony photo recovery software as soon as possible. In order to recover your Sony photos, it is necessary to utilize a powerful recovery software for Sony camera. There are a lot of options if you do a simple research, but RePicvid Photo Recovery is undoubtedly the best free option for Windows and Mac users. In addition to the above advantages, RePicvid is also extremely easy to use for any new users, no matter if you want to recover files from memory card or computer. 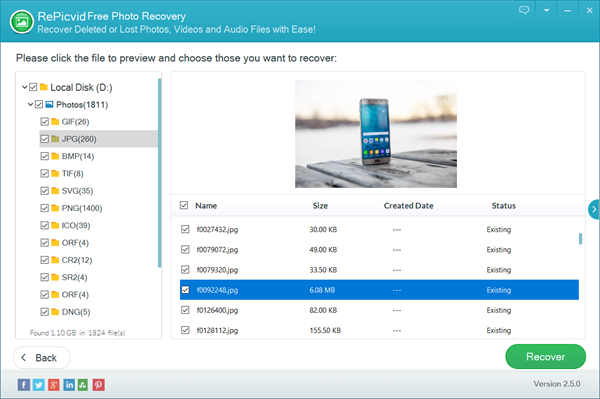 Please download and install the free photo recovery tool on your computer, then connect your memory card to computer via a card reader or SD card slot. Next, follow steps below. Step 1. Run the free Sony camera recovery software. Step 2. Choose the file type you want to recover. Step 3. Select the partition of Sony camera SD card, then click Scan. Step 4. Preview the found files, especially ARW, SR2, JPG, MP4, etc. Step 5. Select the files you need, then click Recover button. You will be asked to choose a location for the Sony camera files to be recovered. Once the recovery is finished, you can check the files in separate folders. Do regular backup for your important files. No need to explain this point, but you should learn from experts online about how to schedule the backup. Don’t put all your eggs in one basket. Store your photos on multiple media, like SD cards, external hard drive, computer and even online cloud space, so that if one fails, you will still have some photos to show. Use Copy and Paste instead of Cut and Paste while transferring files between different devices. Interrupted transfer is a famous killer of camera photos and other files. Backup cannot avoid all data loss of course. More often than not, new files are deleted before the owner is able to make backup in time. Nevertheless, no worries, because you can always trust the photo recovery software above. Drop a line below to share your problems or experience with us!